First of all, make sure you updated your video card drivers. This may solve 99% of all isues. This is becasue of Nvidia driver update. Revert back to 365.19. Open the system folder in your SpaceEngine directory and delete the file atioglxx.dll. Note that this mode is experimental and may glitch, collision detection also works incorrectly in this mode. I stress the special role played by videocard onboard memory (VRAM). 512 MB is the absolute minimum. The engine uses a large amount of data that must be in video memory (textures, meshes etc). The goo performance will be only with a dedicated video card with 1024+ MB of onboard memory. Almost all modern $100+ devices can run SE smoothly. CPU power is not so important for SE, but having many cores could improve performance on fast interstellar and intergalactic flight. CPU does not significantly affect the landscape generation speed because it is done completely on the video card. then you should open Nvidia Control Panel or ATI Catalyst and force SpaceEngine.exe run on NVidia/ATI graphics card. If you do not find a SpaceEngine profile there, create a new one. 1) Open Windows Control Panel, navigate to Display, and set the DPI scaling to "Smaller - 100% (default)" - it should look like this. 2) If you want to adjust the DPI scaling, click on "Set custom text size (DPI)" in the sidebar and change its value to suit your preference. - Star mode "points" and "sprites" look the same. This is right! This switch changes the rendering technology, not the visual appearance. - Comet nucleus star-sprite will shine through planets [example]. You still failed to explain what textures aren't loading. Also, in your SpaceEngine/system/ folder, is there a file called atioglxx.dll? I was exploring a binary star system and noticed a change in the color of a star. 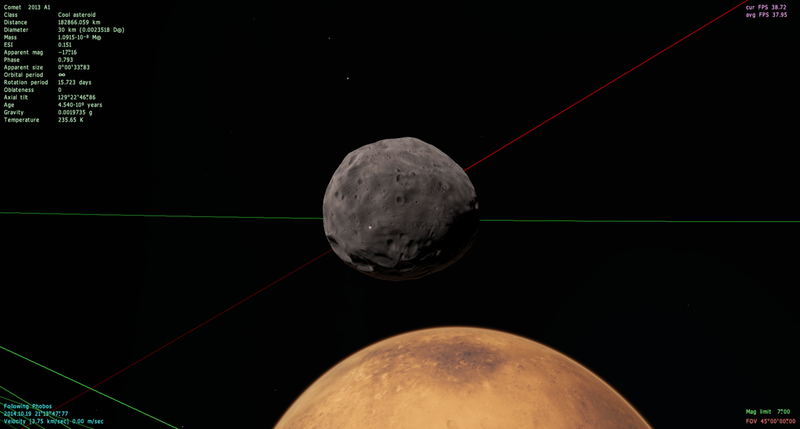 After a little investigation I discovered that when orbits are displayed, the barycenter can filter the light that goes through it. Hi, I've downloaded Space Engine and having trouble running the program. If someone can tell me how to upload the pictures then that would be great too. When I click to start it a window appears, during the load up, saying '(null)(1.5). (null)' The computer then closes the program as it detects something has gone wrong and then the laptop says it has purposefully closed it through the Data Execution Prevention (DEP) software it has. Can anyone help me please? This shouldn't happen. Are you sure you using SE 0.973? This skybox seams artefact was fixed in this version. Apparently I am an idiot, but thanks to your reply I quickly found the problem. I followed the instructions to the letter, except that I always use a shortcut in the top level of the game folder to start up Space Engine. This obviously still referred back to the 0.9.7.2 folder, causing that version being started. After changing the shortcut, everything looks good. sebastiangilbert160, update your graphics drivers, and if possible, upload the log file as mentioned in the beginning of the thread. Idk if this is a bug or not, but apparently I can only enable FXAA if real planet brightness is disabled. When it's disabled and I turn FXAA on and off I can really see the difference, but with real planet brightness on, no difference at all. Kind of a bummer since I much prefer real planet brightness. It works fine for me. Keep in mind that FXAA only smooths out regions of high contrast, so planets that are significantly darkened will not be affected the same way as bright planets. Go to Earth's moon and toggle real planet brightness on and off and see if it also affects FXAA. Yes for me too. It looks like FXAA is "almost not working" for dark places, but it is do working. lhommealenvers, this is not a bug. The lens flares rendering mechanism take a pixel from the screen to determine the flare color and intensity. 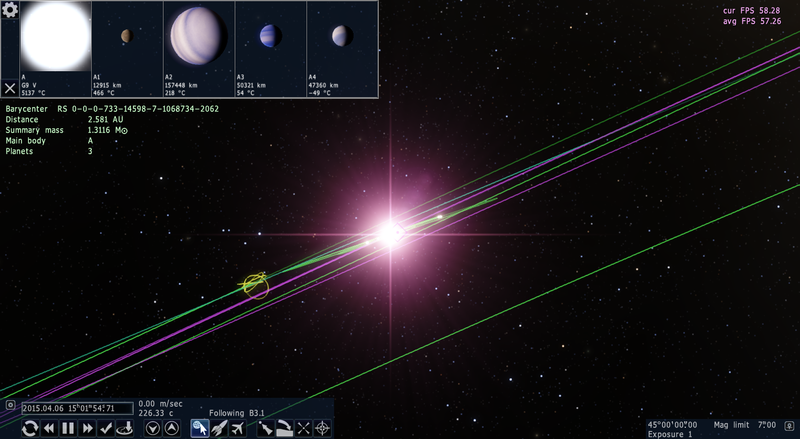 And barycenter mark and orbit paths are transparent objects, so they can change the color the lens flare, like if you look at the sun through color glass. You are using SE 0.972! Update it to 0.973 on the download page. This "error" has been reported so many times after 0.973 release. I'm curious why??? HI there, I am new. Ok so whenever I try to run this program or play it I can get to the main menu. But when I click on Planetarium it will just load for a minute and then when I try to click around it will freeze up or be difficult to move around in. I can still hear the music in the background but I cant do anything else. What is wrong? SB1001, post your log file, as clearly stated above. I can't find this posted anywhere, but movement can get stuck on if any of shift, alt or ctrl are pressed while moving i.e. hold d, hold shift, release d, release shift - this is minor, but irritating.